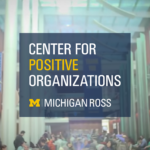 Mari Kira and Stacey Scimeca represented the Center for Positive Organizations in an interview, “The Heartbeat of Human Capital: Q&A with the Center for Positive Organizations,” for the Ross Human Capital Club. Throughout the Q&A session, Kira and Scimeca discussed the purpose and goals of the Center, best practices for Positive Organizational Scholarship (POS), and how to apply POS to human resource management (HRM) and human capital consulting. Kira is the CPO’s research director and a member of the core faculty, as well as an assistant research scientist and lecturer for the Department of Psychology. Scimeca serves as the Learning and Engagement Specialist and leads the +LAB program, which is open to graduate and undergraduate students from across the university.